It was a long time coming but it was happening. My good friend Mike France,as a CADAC member, gave me the opportunity to fish the River Dee in Wales in which i eagerly anticipated. 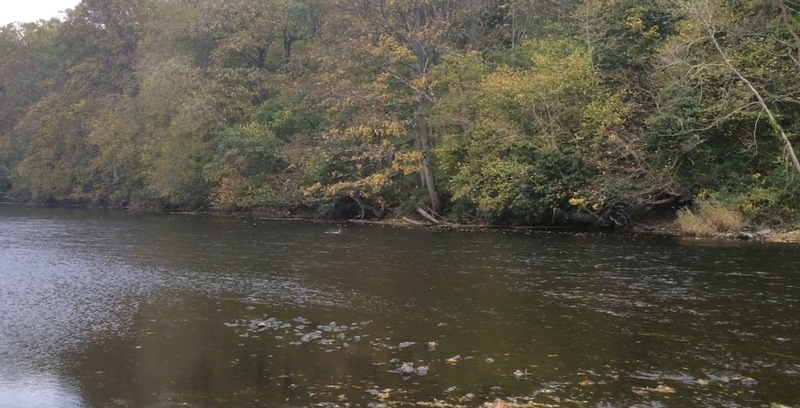 This would be my first non urban river, used to the industrial era mill walls tower above me or coal mined cliffs all around me i would be situated with cows and sheep surrounding the fields around me. We were going for Grayling and were both fishing a beat that Mike hadn't fished before. With no rain for a week the day was gloomy and misty on the hills when the sun came up. It had been a 6.30 start. It was around 9am in which we got our boots wet, a strong downstream wind blowing into our faces, a light rain or spray off the river added to the wind chill. The river here was very different to what i was used to back home, a small pebbled bottom with very few trip hazards, but something that would have it's own particular problems. The first mistake i made that day was not bringing my wading stick, a new stretch with no stick when you can't swim is pretty bloody stupid but being 6ft 8 the deepest section we found was no higher than just below my buttocks, and with a nice steady current there were no real difficulties other than the quite slimy bottom. Clarity was 100% you could see the bottom all the way across, the only thing affecting visibility was the wind and the lack of 'darkness' on top of the water, usually created by trees or cliffs, which meant the indicator was difficult to see on top of the wind swept waves. Usually i would counter act this by lifting the indicator but in the strong wind it would literally pull my nymphs out of the water and cause a tangle worthy of a rerig. Things started off quite well, i hit my first fish within 10 minutes next to a patch of ranunculus, it looked like a grayling at first, dark brown/grey body with blue and purple hue and a totally white underside, but as it reached the net it was a trout! very long and slender, and with a peculiar colorset i hadn't seen before. That was soon followed by a grayling, unfortunately it was no bigger than my hand! As we zigzagged up stream battling the wind, Mike hit a grayling of similar size swiftly followed by a nice brownie. Things then went quiet, we soon realised the water behind us had become deeper and the water we was fishing was shallowing up, despite it being the fishier looking water with ranunculus for cover it was giving nothing up now other than a small salmon parr. Fishing the stretch behind us proved almost impossible, this side had no cover so was a glare of cloud grey and 4 inch waves caused by the wind. It was now 11ish so we decided to head back to the car, have dinner and a rethink and get back at it. Dinner ate and my throat suddenly decided it didn't like Wales, i guess the air and water was to clean compared to the Irwell and i'd developed some form of substance addiction that the River Dee lacked. With difficulty talking i felt like a complete tool knowing Mike couldn't get a proper sentence out of me, i never usually shut up! We decided to look for features as this beat, just outside Corwen, was a very long straight with no shelter creating a wind tunnel effect. As we headed up cow filled fields i spotted a decent fish swim out from the shallows into a bed of ranunculus, i gave it a few casts but with how shallow the water was i was hitting the weed every time so we continued onwards. It was then we saw a big rise, followed by a couple of small rises on the fair side. Funnily enough this was a section where the nearside shallowed enough to create a bottle neck and force the current to the far half, thus a feature! We waded in and worked our way upstream and i hit a fish which after 2 shakes of the head was off. Then looking at Mike we both seen a huge rise no further than 6 feet away from him, as he turned towards me in half disbelief half excitement a huge fish lept out of the water behind him! Struggling to talk i tried to tell Mike but by the time he turned it left a huge splash in its place. I told Mike it was a few pounds like Big Barry, as he likes a jump. Not knowing whether Mike believed me or not we continued fishing and the Olympic diving finals began. Salmon easily double figures began launching themselves several feet into the air some inside our rod length, the most impressive happened directly in the middle of us and we was only 15 yards apart or so. These fish weren't bothered! 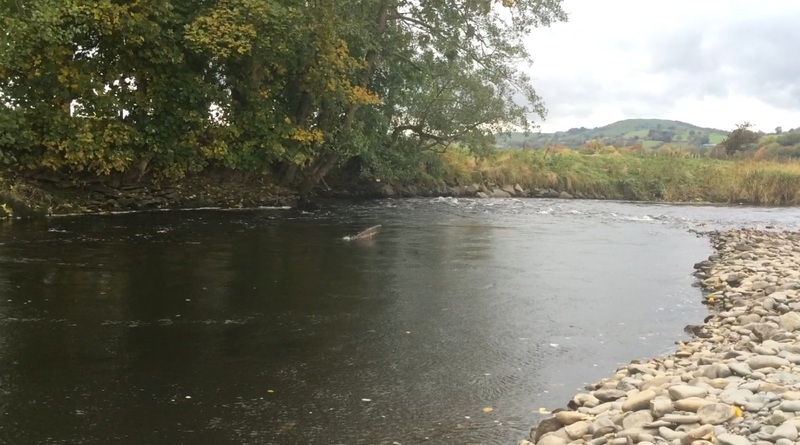 We continued to fish in the hope the Salmon weren't scaring the fish off as this is more natural than slabs of concrete being thrown in but without any luck, the closest i came to getting something else was when a salmon shark finned up to my indicator. It was all good fun but we wasn't catching so we decided to head upstream. Pheasants flying in fear as we approached their hiding spots and kingfishers heading upstream to our next run. Even the odd Military Jet flying over to add to the over-worldly experience. The end of the run was a bend and just before it was 3 or so rocks, now this is where the difficulties began and shows how rivers are dangerous. The river clearly was moving but with very few features it's easy to mistake it for a slow current, wading in on the slippery rocks you could feel yourself being pushed downstream, digging your toes and heals into the gravel to get to the coarser stones you still had difficulty stepping upstream for each next cast. A couple of times my foot would be lifted off the bottom and for a second i'd be flamingoed midriver. Keeping my wits about me i didn't wade out as far as i could nor wanted to but without my stick i couldn't take the risk. The rock i fished gave me 2 trout of a more familiar colour and then the salmon began to show off here too. Maybe i was allergic to Salmon hence my throat packed in. As i fished up to the 3rd rock a got a soft take and immediately saw a grayling on the other end, it wasn't a huge grayling but it was one i needed, it had been a tough but enjoyable day so i wasn't going to allow myself to lose a fish. Now with the current the grayling immediately went downstream of me so i knew i had to follow. I mistakenly turned to face the grayling and the force of the water was trying to bend my knees so hard, lifting my feet off the bottom with each step i took so i waded towards the bank so i could follow the grayling safely and get downstream of it. After a brief fight in a tough current i brought the grayling to net which was quickly washed between my legs, like a giraffe on ice i did some leggy manoeuvres and netted the grayling. it was a nice grayling, quite stocky around the head and a wash of blue hue to it's silver portions. Getting back into the fishing the wind picked up and the current got stronger to the point i couldn't fish the runs i wanted after 2 rerig tangles in a row i decided to go sit with Mike and enjoy the wilds and the fishing so no frustration would ruin the day. I found Mike in a deep narrow gully with salmon jumping bankside, it looked very salmony but would of held other fish. After a chillout and a relax we headed back to where we first fished and the wind was now blowing a gale, 1 more tiny grayling a salmon parr and another trout in 20 minutes was enough for me to call it a day, Mike fished for 5 more minutes as i sat in the cow field packing away. On our way back to the car we came across my first EA bailiff (he said the Welsh version is called something else now but it was too windy to hear) It's always nice to run into a bailiff as you hope any wrongdoers run into them also.